Losing our keys may be something we never wish to happen, but it does happen, and it happens more than once! This is why we need residential locksmiths who are trustworthy and reliable. After all, hiring them could be security risk, as we are giving them some form of access to our homes. It is thus important to find locksmith companies that are well known for their good practices. Apart from ensuring the reliability and trustworthiness of residential locksmith companies, we must also look into the types of services they offer. Typically, these companies offer a wide range of services, including assistance during emergencies, installation of new locks and deadbolts, and rekeying of locks. Some of these services are described in detail below, along with the discussion on the importance of hiring a qualified locksmith. The process of rekeying ensures that only a new set of keys work with old locks. This service comes handy if you have recently moved to a new home and are not aware of who else has keys for the existing locks in your home. To avoid the possible entry to your house by a stranger who might have a copy of the house keys, you can ask a locksmith to rekey the locks. This service also allows you to have separate keys for extra rooms in the house that can be given to your guests and employees. A home, they say, is only as secure as the locks. If you have just moved to a new home or if you simply need to replace some of your locks at home, you may consider availing of the installation services of a professional residential locksmith. Your locksmith will help you in choosing the right type of lock for your home. Although there are many DIY instructional materials that can help you choose and install locks on your own, hiring a professional to do it can help you make sure that the locks are installed correctly and are functioning properly. 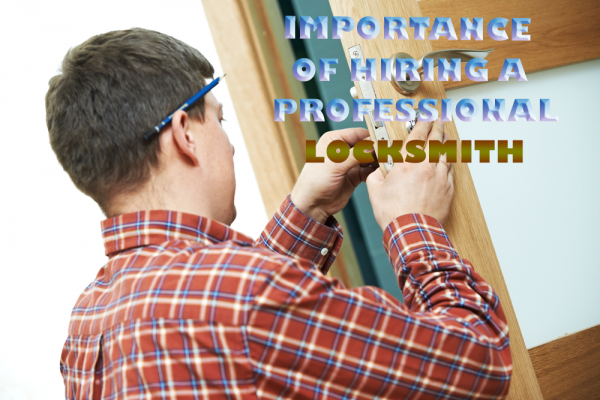 As mentioned previously, there is a security risk involved in hiring locksmiths, especially when these locksmiths are unprofessional and are engaged in unethical practices. To avoid putting the security of your home at risk, it is crucial that you look into their credentials before availing of their services. Doing so not only enhances the security of your property but also guarantees the correct delivery of the service you will avail. It is true that licencing is not required in all states as far as offering locksmith services is concerned. Nevertheless, it is still important to ask whether they carry any type of licence (such as a business license) for practicing their trade. A must for any locksmith is insurance. When hiring one, you should insist on seeing their insurance papers instead of just taking their word for it. If they do not carry any insurance, then you are better off looking for another company. A company’s reputation is a good reflection of its performance. Professional locksmith companies care highly about their reputation, as even the smallest incident could affect the way they are perceived by their existing and potential clients. A good way to learn about a locksmith company’s reputation is to check its customer feedback. Customer reviews of its services may be available online. Study the company’s customer feedback thoroughly before finalizing your choice. Most professional locksmith companies are willing to offer a warranty for their services. This will give you the peace of mind you need with regard to the quality of the work they will do. If your target locksmith company is not open to this, consider looking for another one that is willing to do so. You should ask for estimates from multiple locksmith companies to have an idea of the prevailing rate for locksmith services in your area. However, it is important that you do not hire a locksmith based only on cost. Consider the other factors mentioned above to make sure that you are hiring a reliable locksmith. Although it is time consuming to go through heaps of information about locksmith companies in your area, doing so is the best way to make certain that the locksmith company you are hiring is professional and trustworthy.